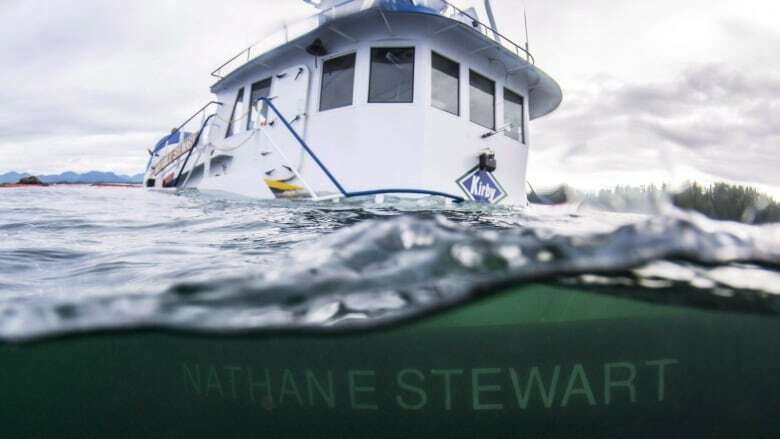 The Nathan E. Stewart ran aground in 2016, spilling an estimated 100,000 litres of diesel into waters near Bella Bella, B.C. A B.C. First Nation is suing the operator of a sunken tugboat that spilled thousands of litres of diesel into waters near Bella Bella. The Nathan E. Stewart spilled an estimated 110,000 litres of diesel and another 2,000 litres of lubricants after it ran aground in the Seaforth Channel on Oct. 13, 2016. The Heiltsuk First Nation says the spill contaminated valuable clam beds worth up to $200,000 annually to the Indigenous community. Subsequent reports found the sailor on watch fell asleep before the crash. On Wednesday, the First Nation announced legal action against the operator, as well as the provincial and federal governments. "The governments of B.C. and Canada, and their agencies, and the polluter — the Kirby Corporation — responded slowly, ineffectively, and with shockingly little regard for the health and safety of our people and our way of life," said Marilyn Slett, a Heiltsuk First Nation elected chief councillor. "We are seeking compensation for cultural and financial losses, associated with harvesting and cultural disruptions, and the cost of environmental testing." The Nathan E. Stewart ran aground in the middle of the night when a crew member fell asleep during his watch in the early hours of Oct. 13 2016. Once provincial and federal crews arrived, gale force winds continued compromising cleanup efforts, again pushing thousands of feet of boom out of place. Severe storms would halt operations altogether several times over. Heiltsuk hereditary Chief Harvey Humchitt says the First Nation was misinformed about how serious the incident was. The tug was lifted out of the water more than a month after it sank. 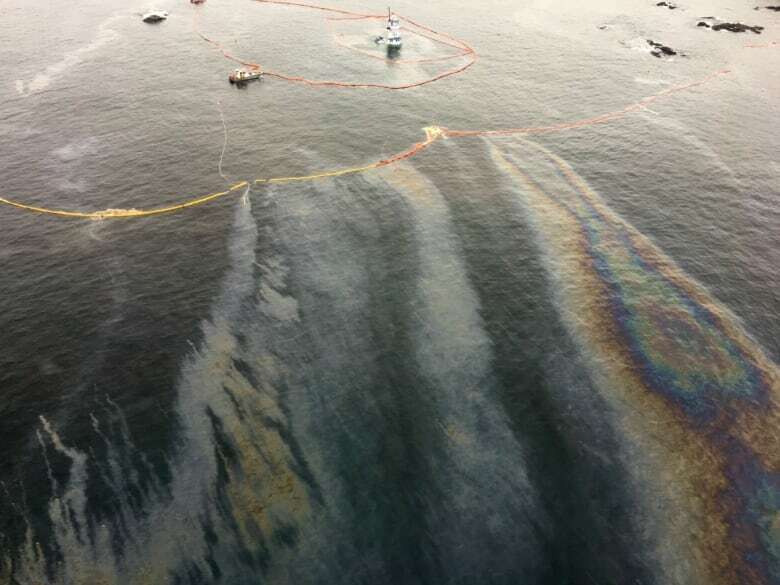 The incident ignited concerns over the efficacy of the provincial and federal government's ability to respond to significant oil spills. "This pattern of exclusion and incompetence through the crucial hours of the spill still persists today," said Humchitt. The First Nation has halted harvesting of clams and shellfish in its territories indefinitely following the spill. The Heiltsulk says the federal and provincial governments did not require the Kirby Corporation to conduct a robust environmental impact assessment. Heiltsuk officials insist that community members have taken it upon themselves to consistently monitor the area and test for contaminants. Estimated costs of the sampling have been about $500,000, according to the community. "We have undertaken traditional and scientific testing to determine the scope of the spill impacts. Research, while essential poses a considerable financial and administrative burden on our people," said Slett. Slett says the community's ability to harvest marine resources is inherent to its way of life. In an emailed statement to CBC News, B.C. 's Ministry of Environment said it is "committed to work with the federal government and to engage with Heiltsuk as appropriate for a federally-led initiative." However, it would not comment further as the matter is before the courts. A spokesperson from the Kirby Corporation said its legal counsel will be reviewing the claim and taking the appropriate actions to defend our interests in court. Transport Canada has laid three charges against the Kirby Corporation, including two pollution-related counts.